Septic Tanks Alberta | Residential | Tanks-A-Lot Ltd. The first question new homeowners ask when developing a lot is how much does a septic system cost. Our introduction to private sewage systems will answer these questions and many others that you may have not even thought of. Documents include budgetary estimating, site evaluations, and calculations. Planning a home improvement project? 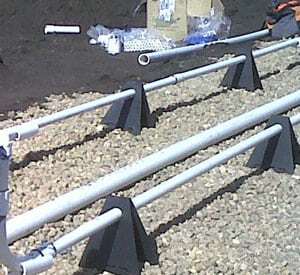 Choose the products you need and find a qualified contractor to install them. The main uses for underground tanks in residential applications are water cisterns, septic tanks, sewage holding tanks and sewage treatment plants. CISTERNS Water cisterns are used to hold water for household uses, also known as “potable” water. SEPTIC TANKS Septic tanks are used in conjunction with a septic field, pressurized mound or municipal pressure collection system. SEWAGE HOLDING TANKS Sewage holding tanks have a single compartment for raw sewage and require frequent emptying by a vacuum truck. TREATMENT TANKS Sewage treatment plants use aerobic bacteria to break down the organic content of sewage and produce a clear, odorless effluent. Precast concrete tanks are the preferred choice for underground residential applications, and they have been the accepted standard for over 60 years worldwide. 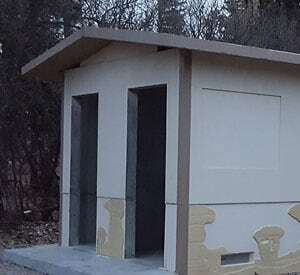 The vast majority of installations in Western Canada are precast concrete because of its clear superiority over other materials choices such as plastic or fiberglass. Concrete tanks do not require precise hand backfilling with pea rock. While filling with water to equalize pressure, concrete tanks do not deform out of shape. Sticks and stones will not puncture a concrete tank. Concrete tanks do not require strapping and anchors to prevent them from floating or popping out of the ground from high water tables or during spring thaw. All these things add up to simpler and less expensive installation and backfilling for concrete tanks than plastic tanks. 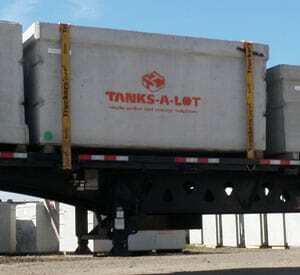 Tanks-A-Lot Ltd. has become the industry leader by focusing exclusively on precast concrete tanks and related products. Our superior designs, production quality and attention to detail result in a superior product that is backed by a 20-year limited warranty*. As the exclusive producer of ‘cold-seam tops’ in Western Canada, our 1-piece tanks up to 2,200 gallons in size are widely recognized for superior strength and durability. We also manufacture 2-piece tanks and modular tank systems that can be used individually up to 7,500 gallons or in clusters up to 100,000 gallons. Tanks-A-Lot is a manufacturer and distributor of Modulair® Wastewater Treatment Plants, scalable systems capable of treating up to 300,000 gallons per day. Please complete this online form to record the system’s installation date. If this online form is not completed, you will not receive the full benefit of the limited warranty term.